I'm working on an analysis for the Residences at Gallery Place, located at 777 7th St NW. As I reviewed my information, I noticed that a lot of condos from the Artisan are listed on MLS. Of the 17 units I documented in my earlier posting about the Artisan, two (units #315 and #713) are no longer listed. Three units have been added (units #203, #309, and #904), bringing the current number of units listed in MLS to 18. Of the 18, five are listed by McWilliams|Ballard, the Artisan's marketing firm; those units are highlighted in yellow in the figure below. 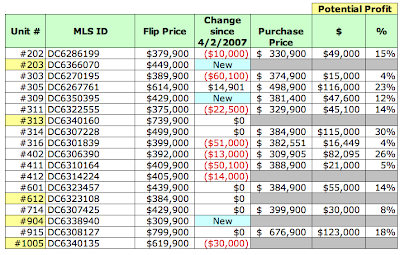 I looked at the data to see what, if any, price reductions are taking place as time progresses and no buyers appear; the data analyzed were MLS listings for the weeks ending March 30 and April 27. The results are striking. The "You've Got Nerve" award goes to the owner of unit #305, who raised his price by $14,900. As you can see, some owners have taken aggressive pricing action to sell their units. Units #303, #316, and #411 have each had price reductions of at least $50,000. Even if some units sell at current prices, transaction costs will surely result in a loss for the seller, e.g., unit #714. I'll keep an eye on this to see what happens. your blog often but nearly everything you work with is out of my range. Do you review properties at around $250K? My posts have been focused on buildings that have come online within the past 2-3 years. I've not focused on condos based on a particular price range. However, there's no reason I can't do that so once I've finished work on my next post, I'll look into it. Brandywine Crossing is one property I've posted about that has condos in the price range you're interested in. Thanks Keith! I will stay tuned.